Fort Lauderdale, Florida [February 8, 2019] – Visual Edge Technology (VET) has announced they will be hosting their First Annual Managed IT Summit at this year’s Imaging & Technology Education Exposition (ITEX) trade show. Nearly 100 of the company’s sales V.P.s and sales leaders will take part in this event. VET is one of the largest, value-added resellers in the office automation industry and is comprised of a group of 34 Office and IT Service providers, brought together through strategic acquisitions. ITEX 2019 will be held at the MGM Grand Hotel, in Las Vegas, Nevada, on April 24th through April 25th, 2019. A broad field of exhibitors, as well as a record number of attendees are expected to attend the event. Experts in a wide array of areas, including print, Managed IT, software solutions, telecom, Smart Office and more will all be on hand to offer their insight and technical advice. For more information about ITEX 2019, please visit www.itexshow.com. About Visual Edge Technology, Inc. Visual Edge Technology, Inc., a family of Office and IT Solutions Companies, incorporates a strategy of operating through established dealerships across the U.S., focused on providing a broad line of office solutions, including the sale and service of automated multifunction products, wide-format solutions, managed print services, document management software, network management services, and IT solutions. Visual Edge sells products supplied by Konica Minolta, Canon, Xerox, HP, Kyocera, Sharp, Samsung, Muratec, Okidata, Toshiba, Kip, Lexmark, Ricoh, Epson, and Panasonic. Through its acquisition strategy, Visual Edge will continue to identify successful companies that focus on providing simple solutions to complex challenges. 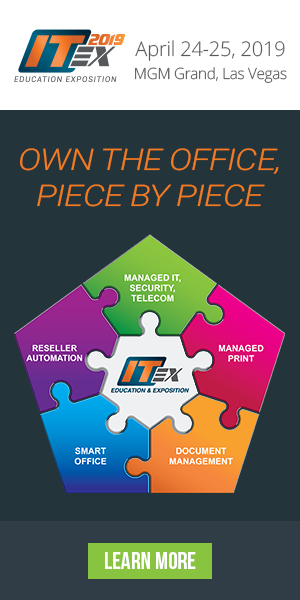 Imaging & Technology Education Exposition (ITEX) is the largest and most extensive national trade show, connecting vendors and resellers in the office technology space. Founded by Marc Spring in 2001, ITEX was developed to provide dealers with access to a vendor-agnostic trade show. ITEX features practical education that addresses modern industry solutions to help grow their businesses. As the show has grown over the years, it has proven to be a huge success—with revenue growing 780 percent between the show’s inception in 2001 and when Spring sold the show in 2009. Spring reacquired the show in 2016. For detailed information about the 2019 show, visit www.itexshow.com.